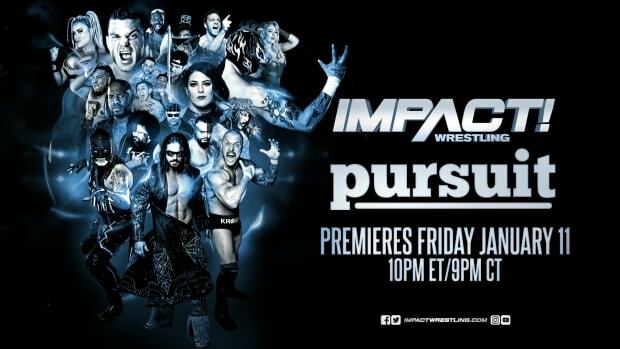 Impact Wrestling Results (6/12/14) - Knock, Knock. Who's There? The Monster Abyss! A video package starts off by showing MVP, Bobby Lashley, and Kenny King. MVP talks about power and taking over. He says sometimes blood has to be spilled to get power. He brought his friend Bobby Lashley into the company. He is the Director of Wrestling Operations and can control the show. However, he has enemies against him. Eric Young&apos;s music plays and he comes through the curtain and on the stage. He walks down the ramp as the crowd cheers. EY gets in the ring and grabs a mic. Eric states in three days it will be him vs. MVP at Slammiversary. He wants MVP to come out, and he can bring his buddies as well as Dixie Carter if he wants. MVP&apos;s music plays and here comes MVP. He walks out with King and Lashley behind him. MVP has a mic. They stand on the stage. MVP tells EY that there is no love lust between he and Dixie. He doesn&apos;t have a friendship with Dixie. He is fighting EY at Slammiversary, not Dixie. EY states it will be them two fighting... or three, or four, or five. He knows King and Lashley will be part of the match. MVP says he is so amazing and while EY thinks he can beat him, MVP will be taking the TNA World Championship. MVP says EY can beat him at something like extreme fishing. EY then plugs his new show No Limits. EY just wants a request. MVP asks and EY states he wants a fair fight. As much as MVP wants to guarantee that, King has emotional outbreaks at times but Lashley can be contained. EY states he is talking to him man to man, not wrestler to wrestler. EY states if a bigger and better man wants to take the belt, so be it, but if he gets attacked from behind and outnumbered then that is not wrestling. That is garbage. EY will do absolutely anything to make sure that doesn&apos;t happen. MVP thinks about that statement. MVP says he is not an unreasonable man. He will grant him the choice of any stipulation for their match at Slammiversary. MVP says EY has to beat all three of them tonight. King states he is a loser and he can&apos;t beat two of them. EY says he is not going to discount him, but he will try. EY asks if it is 2 or 3. King grabs the mic and says 2 but MVP pulls it away. He says if EY can beat any two of them then he can pick the stipulation. He won&apos;t go far though. EY says he heard that so much in his life, but he has accomplished everything people said he couldn&apos;t. He says MVP isn&apos;t man enough to take the belt. MVP wants to introduce EY to his little friend... his first opponent, Bobby Lashley! These two fight on the outside but EY rolls Bobby in. Bobby stands and goes right after EY and puts him in the corner for multiple shoulder blocks. He picks EY up on his shoulder and then hits a back body drop. Bobby bounces off the ropes and plants an elbow but EY moves out of the way. Both stand and Bobby whips EY in the corner but EY hips up and goes behind Lashley. He rushes in the ropes and hits a forearm to Bobby and covers but he kicks out. Both get up and EY takes Bobby to multiple corners head first. Bobby reverses it and whips EY into the corner again but EY flips over and lands on the apron. He does a shoulder block to Bobby and then slides under but Bobby grabs him by the throat and tosses him over the ropes to the outside. Bobby goes to the outside and grabs the championship. He gets in the ring and punches EY in the face. He then grabs the belt and waits for EY to stand. Just then, Samoa Joe&apos;s music hits and he runs out. He gets in the ring and punches Bobby in the face multiple times. Bobby fights back and whips Joe in the ropes, but Joe holds on. Bobby runs to him but Joe takes the ropes down and Bobby goes over. Bobby walks up the ramp as Joe stares at him. A video plays showing Willow. He says he is beaten but he is not broken. He sees the weakness. Behind the mask he sees the war. Patience is on vacation. He will win the war. Eric Young is in the back holding his back. He says he heard something pop. A medic is checking on him and says he shouldn&apos;t go back out there. EY is in pain. Samoa Joe is backstage talking about Bobby Lashley and his built. He says people aren&apos;t built that way, but that is his next victim. Music plays and here comes Magnus. Magnus walks down the ramp and Bram is right behind him. They get in the ring. Bram grabs a mic. He proudly brings to us the most brutal man he knows... Magnus! Magnus grabs the mic. He says Bram is his oldest friend and best mate. Bram promised him to bring his old self back. People talked about Magnus saying they want him a certain height and want him to wear suits. He is not going to be that anymore. It made him sick. With Bram with him, they are unstoppable. Bram grabs the mic and says Jeff needed an alter-ego to be feared, but now he knows who the one who should be feared. A laugh comes across the arena and here comes Willow. The screen turns black and white. Willow has a mic in hand. Willow says he is out here to give them a chance to run. He is dangerous. He is not responsible for his actions behind the mask. He is from Jeff&apos;s imagination. Remember, "Hardy, Hardy, Hardy, Hardy?" Where Jeff can&apos;t go Willow can! "Willow, Willow, Willow!" He is glad Magnus found himself. At Slammiversary, "we" will take you down. Magnus says he is fine with Jeff and his alter-ego fighting him because he has Bram. Willow states "we" again. Bram gets on the mic and says you are the same person. Willow will have someone in his corner. He will have someone who will take them out. "Knock, knock." "Who&apos;s there?" "The Monster Abyss!" Abyss&apos; music plays and he comes out. Willow goes in the ring and attacks Magnus. Willow takes him out. Abyss goes after Bram. He fights him in the ring. Abyss knocks Bram out of the ring. He wants to get back in but Magnus holds him back. They walk away as Willow and Abyss stand in the ring. Video plays showing last week where Bully Ray busted Ethan Carter III open and then Kenny, Lashley, and MVP attacked Ethan backstage. Ethan is backstage. He says he has the bandage on his head where he bled last week. No one makes a Carter bleed. Dixie is in Dallas but he will carry it on. Do you know who he is? He&apos;s a Carter and the world needs them. DJ Z is at his DJ booth at ringside. He introduces himself and then introduces the guy who has got over the fear of clowns... Robbie E. Jessie Godderz is with him. They walk down the ramp together and get in the ring. A voice comes across the Impact Zone. People on stilts are on the entrance stage. The voice introduces each member of The Menagerie. Rebel comes out first. She swings the sticks around. Crazzy Steve comes out next with his balloons. The Freak comes out next. Knux is out and he grabs Rebel who is laying on the ramp. They walk down the ring together and the people on stilts come down next. They all enter the ring as Robbie and Jessie exit. Robbie continually scratches himself. Crazzy Steve gets in the ring with his balloons. He puts the balls in Robbie&apos;s trunks. Robbie stands and notices the balloons are stuck. He starts running in circles and then running around the outside. He runs up the ramp as he hates the balloons. Ethan Carter III and Rockstar Spud are talking backstage. Ethan asks about the special request he wanted and Rockstar says he received it and here she comes now. The camera shows Brooke walking toward them. A video package plays showing Ethan Carter being busted open by Bully Ray last week. It then shows the backstage confrontation between Dixie and MVP where it is an all out war between each other. The lights go out and here comes Ethan Carter III! His music plays and he walks out. Rockstar Spud is behind him. They make their way to the ring. Ethan grabs a mic and wants to thank Spud for setting this up. There are three chairs in the ring. Ethan wants to dispose Ray of his checkered past so let&apos;s welcome Brooke! Brooke walks down the ramp and gets in the ring. All of them sit down. Ethan tells Brooke that they are a trio of trust. They are all friends here. He has a question for Brooke. He asks if she had a relationship with Bully Ray. She did. He asks if it is still going on. She says, "No." Ethan states that it is so sad. Ethan asks if Ray had late nights, a drinking problem or other women. She says no. Ethan asks if he threatened to put her through a table. She doesn&apos;t know what is going on. He never did. Spud grabs a mic and says he set this up. All of a sudden, he tosses his chair and calls for the lights. The spotlight shines on the ring. Spud knows she is trying to cover Ray. She isn&apos;t. Spud grabs an envelope from his suit. He has the evidence. Rockstar Spud opens the envelope and says he is the father. She had a baby with Ray. Brooke doesn&apos;t look like she had a baby and she didn&apos;t. Spud has pictures. A picture of Ray and a baby is shown on the titan tron and Spud says they look the same. Brooke is starting to get offensive. Spud takes off his jacket but Brooke backs him up in the corner. He says he has a broken neck. Ethan stands and says maybe she has to show respect to them like Ray has to. Just then, Bully Ray walks out and gets right in the ring. Spud and Ethan get out of the ring and walk up the ramp. Ray says he has a table with Ethan&apos;s name on it and he will go through it in the future. Ray says he didn&apos;t expect to see Brooke. She was an awesome girlfriend and is sorry it didn&apos;t work out. He is in a different place right now. He hopes she has a great life. Ray hugs Brooke and she hugs back. Ethan starts to throw up and says this is making him sick. This issue needs to come to a head. The crowd chants, "Table, table, table, table." Ethan says there is a time for tables. That is at Slammiversary in Carter country. He requests a table match against Bully at the PPV. Ray will put Dixie through a table over his dead body. Ray says, "Over your head body...." Ray states normally he should jump at the opportunity for a tables match, but since Ethan stated, "Over your head body..." and they will be in Dallas, Texas. How about do something they haven&apos;t done in a long time. Ray challenges Ethan to a Texas Death match. Spud waves at Ethan&apos;s face to cool him down. Ethan stares at the crowd and then at Ray. Ethan says, "Challenge accepted." Ray&apos;s music hits and both stare at each other. Kenny King is hyped up as he is walking in the middle between MVP and Lashley. They are outside of the arena. Lashley tries to calm him down as he gets too excited. MVP agrees but says he has this. They continue walking. Eric Young walks out as his music plays. He gets in the ring and is somewhat limping. Kenny King&apos;s music plays. He walks out and is so cocky. He gets in the ring. King and Eric walk around the ring. King holds his lower back and mocks EY. They go and lock-up but EY works on the arm. Kenny slides out of it and does a hip toss. Both stand and walk around. They lock-up and EY works on the arm again. King reverses it and works on EY&apos;s arm. EY reverses it and takes King down. He gets up and they lock-up. King takes EY to the corner. He backs up but goes for a punch but Eric ducks and punches King. He whips him i the corner. King bounces out and Eric does a body slam. He then falls as he holds his back. EY stands and King runs to him and kicks him in the gut. He goes to the apron and brings Eric out. King goes for a suplex but EY goes for a suplex but King blocks. King then kicks EY in the head. EY falls and rolls in the ring. King enters and stomps on Young and then works on the head. Madison Rayne is backstage and the camera man asks him something. She says she is getting a weird vibe from Brittany but she is not going to worry about that situation. She is worried about the Knockout match tonight and getting the Knockouts Championship at Slammiversary. Eric Young is sitting backstage. The medic is talking to him. He says he told him to not go out there but he didn&apos;t listen. He says he shouldn&apos;t fight in the next match. The medic leaves. Jeremy Borash meets up with Eric Young. Borash asks about the upcoming match. EY states he has one more to go and no one is going to stop him. Brittany is walking down the ramp and gets in the ring. Gail Kim comes out next. Madison Rayne comes out after and gets in the ring. All move around the ring. Gail quickly goes after Madison for a roll-up but Brittany breaks it up. Brittany and Madison talk and then Madison goes after Gail. Brittany steps in and does an arm drag to Gail. They then hit a double closeline. Madison doesn&apos;t want to work with her. Gail stands and double dropkicks both of them. They both fall to the outside. Just then, music plays and here comes The Beautiful People. They stand on the stage. Gail and Brittany are fighting but Gail takes her down with a closeline and then takes Madison down with a closeline. We see Angelina Love and Velvet Sky at the commentator&apos;s desk. Brittany fights back against Gail and smashes her in the corner but Brittany falls to the outside. Madison goes after Gail. She covers but Gail kicks out. Both stand and Gail comes back with a small closeline. She covers but Brittany stops the count. Gail locks in a head scissors on Brittany while Madison locks in a head scissors on Gail. Gail releases it and Madison has it on. Gail turns it into a cover but Madison kicks out. both stand. Madison fights back with kicks to the gut and then a snapmare and kicks to the back. Madison takes Gail to the corner and brings her to the top. Madison climbs but Gail fights back. Brittany kicks Gail in the head and climbs as well. They hit a double superplex on Gail. Both are down. MVP is outside of the arena talking to the referee. He walks away and the camera man walks up to him and asks him about that. MVP state he was just talking to his most dependable referee. A video package plays showing the dominance of MVP, Bobby Lashley, and Kenny King. Mike Tenay and Taz run down the line-up for Slammiversary. You can see the full line-up here on WrestlingNewsWorld.com and TNANews.com! MVP&apos;s music plays and he comes to the ring. Eric Young&apos;s music hits and he walks his way down the ramp in a limping fashion. As he does, Kenny King and Bobby Lashley run down from behind and knock EY off his feet. Bobby holds EY as King smashes his forearms on the back. Bobby then whips EY in the steel steps. They roll him in the ring. MVP punches EY in the face and then whips him hard in the corner. MVP has Eric Young on the ropes. He pounds on his back and then chokes him on the middle rope. EY tries to fight back but MVP punches him in the face. EY stands and punches back. He runs in the ropes but MVP hits him with a knee to the gut. MVP pounds on the back of EY with his knee multiple times. MVP does a snapmare and then a kick to the back. MVP continues to pound on the back and then kicks EY right in the head. He covers but EY kicks out. He covers again but Eric kicks out. Both stand. MVP pounds on the back with his forearm and then hits a back suplex. He applies a camel clutch. Bobby Lashley and Kenny King walk through the curtain and come to the ring. They have the championship and hand it to MVP. MVP grabs a mic. He puts the belt down by EY&apos;s head. MVP says he doesn&apos;t care what stipulation he picks as MVP will beat him. EY will lose and MVP will take the belt from him. Music hits and MVP raises the arms along with Bobby and King. MVP grabs the let and then poses with it. They all raise their arms again. EY grabs the mic. He says, "Boss." Eric says it may not look like it but he won. MVP couldn&apos;t beat him fair. Eric Young says he will face MVP in a Steel Cage match. EY says he will see him in Dallas and remember, "I&apos;m just crazy enough." Eric Young&apos;s music plays while MVP looks concerned. The show fades.